A baby Blue Jay checks it surroundings while waiting to be fed. Upon arriving to Nashville to visit some old friends, I was greeted by 3 baby Blue Jays that had recently fledged from their nest but didn't make it very far. 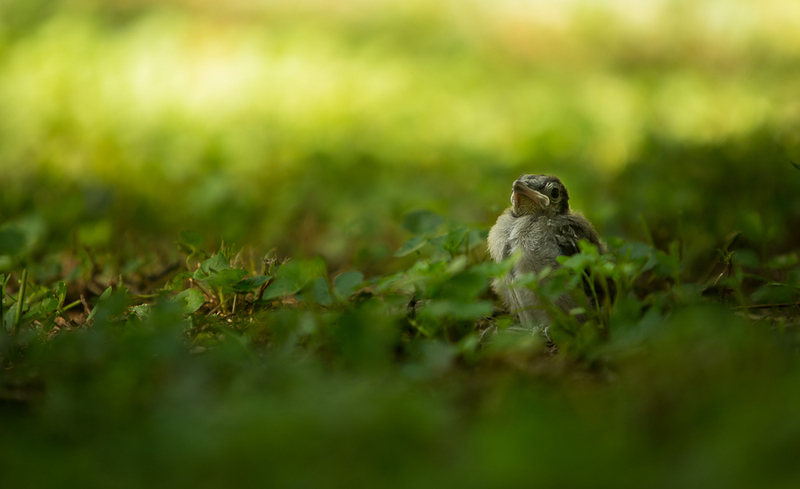 There's some debate over the definition of a fledged bird wether its when a baby bird leaves the nest, or when the bird becomes independent of parental care. Since these baby Blue Jays had left the nest but were still dependent on their parents to feed them, the term we call these are fledglings. For 3 days, the baby birds remained in my friends backyard with the mother and father returning frequently to feed them. Getting close to these birds to photograph them was difficult. Once you encroached on the "too close" zone, the parent Blue Jays would become aggressive and emit their warning calls. It took one of the parents swooping down and attacking my head to know where the threshold of too close was. One of the parent Blue Jays watching over its young. Blue Jays (Cyanocitta crostata) are a very successful species ranging throughout much of the United States, mostly east of Colorado. One of the reasons to their success is their ability to thrive in fragmented forests which is why we see them so often in urban areas. Blue Jays belong to the family Corvidae, which also consists of crows, ravens, magpies, rooks, jackdaws, nutcrackers, choughs, and treepies. Members of the Corvidae family are known for being the most intelligent birds and one of the most intelligent animal groups on the planet. Blue Jays have been seen problem solving such as using tools to obtain food, mimicking other species bird calls to their advantage, and exhibiting complex social systems. There are four subspecies of Blue Jays that aren't easily distinguishable, depending on what region you're in. Male and female Blue Jays have the same markings and plumage making it difficult to tell them apart without observing their behavior over time. A Blue Jays diet consists mostly of nuts, and insects but have been known to include small rodents, baby birds, and eggs from other nests. 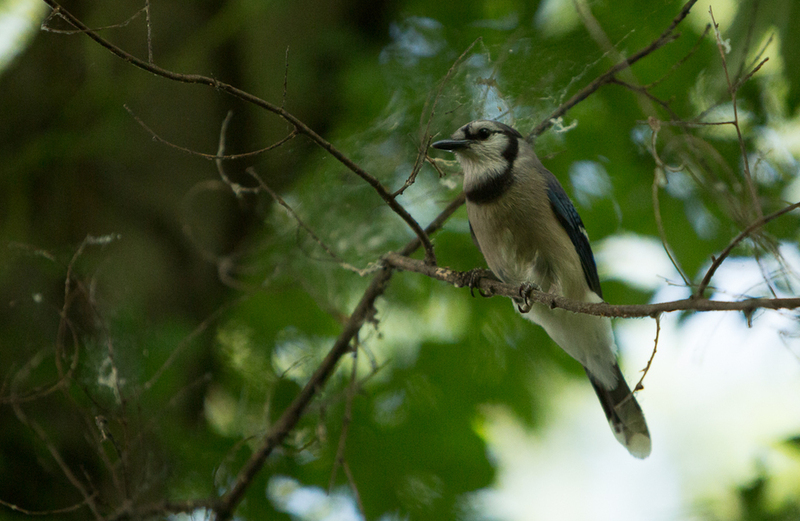 A recent study has shown out of 530 Blue Jay stomachs examined, only six had bird remains inside of it. 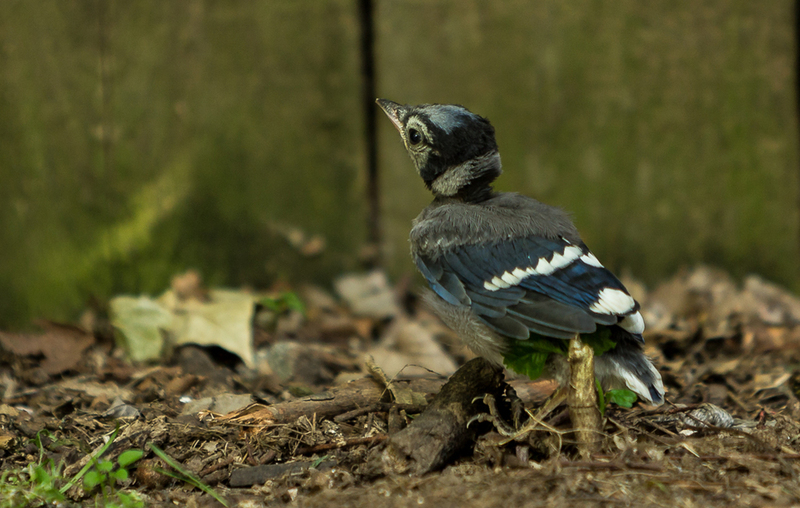 This suggests that Blue Jays feed less on baby birds than once thought. Many birds create caches of nuts to come back and gather at a later time. Blue Jays are no stranger to this method but occasionally will forget where they hid the nuts which then further helps to spread a trees distribution and increase a forests range. Unlike many other bird species, Blue Jays tend to be a monogamous species. Their mating season begins in mid-March and runs into July. The majority of the mating occurs during April. Their nests are generally 10-25 feet off the ground and typically found in the nook where the base of a branch meets a tree. The nest of the birds photographed in this story was precisely in such a location. While the male and female will both gather materials for the nest, The female does the majority of the building and the male does most of the gathering. The young will fledge after about 17-21 days in the nest. There is much variation amongst the time periods baby Blue Jays will stay with their parents after leaving the nest, but it's generally around 1-2 months. Eventually, once the baby birds can fend for themselves, they will leave their parents to avoid competition for resources. Perching on a fallen branch. Blue Jays are popular amongst backyard birders. They're easy to attract by putting out peanuts, sunflower seeds, and suet. Suet should only be offered as feed in the winter due to it going fowl in warm weather. Birdbaths are also known for attracting Blue Jays as a water source. They're easily detected by their call and some have been known to mimic the call of a few different types of hawks to scare off other birds on the feeders. Their most frequent cause of death that's human related comes from domestic and feral cats. While it's a controversial topic, there have been plenty of studies showing the staggering number of bird deaths that occur every year due to cats. The morning I left, one of the baby Blue Jays was missing from the group. The first two days, it was considerably weaker than the other two and was likely picked off by a predator or abandoned by the parents. During that evening when I arrived home from Nashville, I received a message from the friends I had been staying with that the other two baby birds were no longer in their yard along with the parents. It's unknown what their future holds with predators such dogs, cats, squirrels, and many others out there. Practicing using their wings leaping off these rocks. Weaker than the other birds, this one didn't survive. Scott R. Loss, Tom WIll, & Peter P. Marra. 2012. The Impact of Free-Ranging Domestic Cats on Wildlife of the United States. Nature Communications.